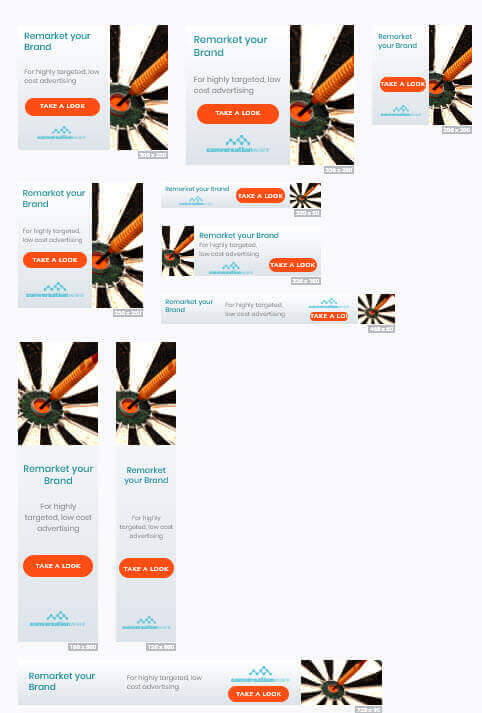 A full list of remarketing ad sizes are listed underneath the examples here. We provide thee remarketing banner ads in either static or animated format in html5. The example set of 10 remarketing ads here would cost £95. Google supports these animated ads (they can run for a maximum of 30 seconds) – cost £135 for 10. We will focus on whether we can 'add value', or not. We like to explore markets, locations, products and services to see if there is a 'fit' and whether we can help clients be successful. Unless we make a significant difference, adding to your marketing efforts, lead generation and profitability, then we figure that we have no place being there. We've done it before, we won't waste your time.